It was announced earlier today that Phil Hill, the first American to win the Formula 1 World Championship, passed from this earth. Phil was 81. He was hospitalized while attending the Monterey Historic Races weekend. I actually had the pleasure of meeting Phil, his wife Alma, his son Derek, and his daughter Vanessa when Derek was racing karts. My memories of him were that he was a genuinely friendly guy who was always willing to talk about cars and racing with an enthusiastic fan. He will be missed in the automotive community. The marque is on the rise. An Alfa Romeo 8C2900 won this year's coveted Best of Show at the Pebble Beach Concours d'Elegance. According to an Autoweek posting, the owners actually drive the car on tours and will continue the practice in the future. We could possibly see this car in the "wild" some time in the future. Congratulations to Jon and Mary Shirley. Alfa Romeo is ramping up the campaign for the Mi.To; their model to compete with the Mini. Check out their new blog at Mi.To. You might even win a trip to see the car in Italy or a tour of the factory! The article in Autoweek,Alfa Blog Chats up the Mi.To mentions the possibility of four turbocharged engines! I wish it was me in this 8C! Alfa Romeo is definitely taking the Mi.To to the forefront. Check out this video interview with two of the designers of the Mi.To. The interview is done in Italian with English subtitles. This video was said to be playing at the Alfa stand at Geneva above the display. From the looks of the footage, the two 8C's were on the West Coast filming. The 2008 Chili Cook-off was a great success. We had more and better chili than ever before. Pictures will be posted soon. Readers of this blog may know that I recently distributed a link that urged the Italian design firm Bertone to continue with plans to exhibit the B.A.T. 11 concept Alfa Romeo commissioned by Gary Kaberle. Gary was the owner of B.A.T. 9, which was the last of the Berlina Aerodinamica Tecnica. It was first rumored that Bertone was in such bad shape financially that they would not be displaying anything in Geneva at all. It turns out that they snuck B.A.T. 11 in to a special design show.Car Design News. Way to go Gary!!! This looks to fill in under the new 147 and will be a "barn burner". I can hardly wait!!! 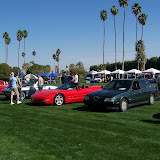 Jennifer and I went to the Desert Concours with high hopes that there were going to be more Alfas in the Car Club Corral, but our 164 was the only one! There were only 3 others in the whole show, one of which is pretty significant. Symbolic Motors was showing the 6C2500 Villa d'Este Touring. It was magnificent. We had fun all by ourselves. Misha came along for the ride also. 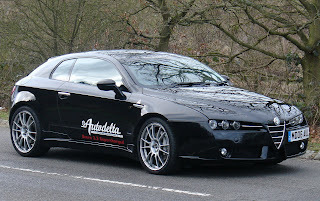 We had several people stop by and talked about Alfas in general as well as 164s specifically. Hope to see more people at the Cars and Coffee on March 29 in Irvine.